I have, alas, been stalled many a night these past winter months in my DSO projects for visiting the Messier and Best NGC objects with my Vixen FL-80S/640mm refractor; The reason has been primarily high atmospheric humidity accompanied by reduced transparency due to haze and fog (further enhancing my suburban light pollution), and this condition is not going to change in the forseable future (*). 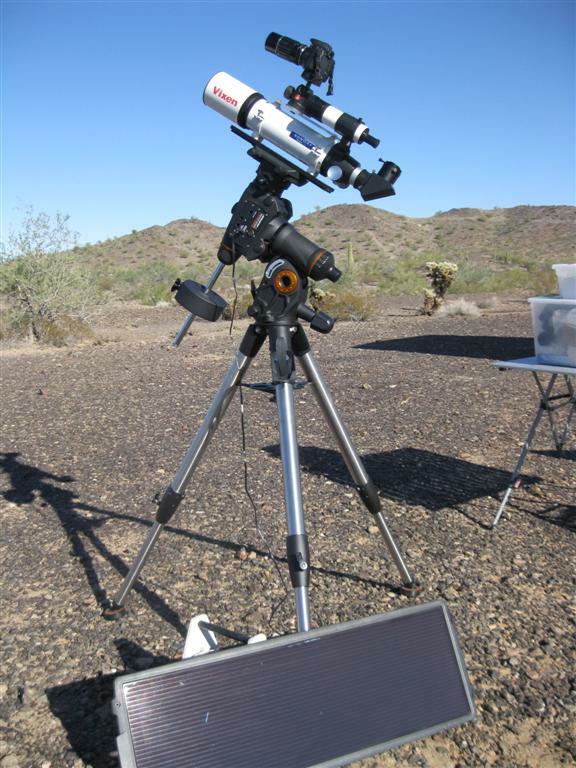 I have therefore decided to set out on another astronomical endeavor, which should be feasible also on the many partly cloudy and/or moderately hazy winter nights, where DSOs, or even the fainter OCs, are out of reach. 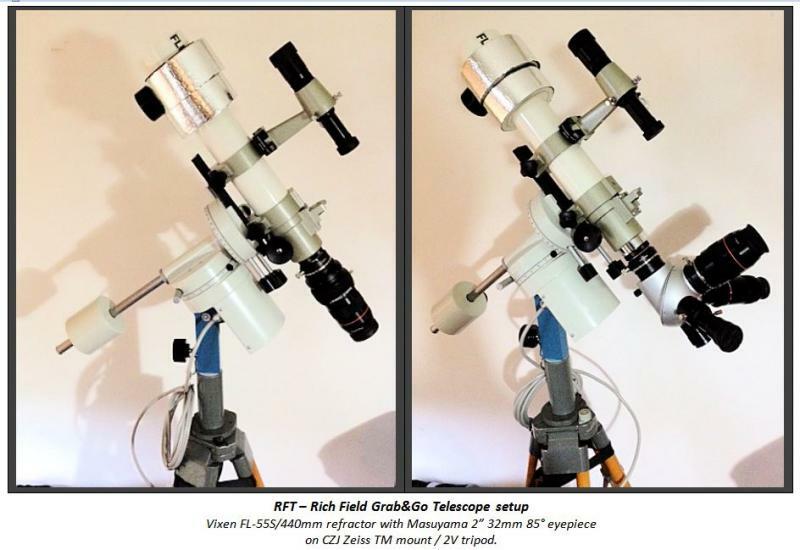 This project will focus on large objects, including stellar associations and molecular clouds, using my small, classic Vixen FL-55S/440mm refractor in “Rich Field” mode with my Masuyama 2” 32mm 85° AFOV eyepiece. I plan on using this setup in both traditional Japanese “straight through” mode for 14x @ 5½° TFOV (XP~4mm), and in the more comfortable western mode using my Zeiss eyepiece turret with 1.5xGPC for 20x @ 4° TFOV (XP~3mm). (*) On January 25. 2017 the EAA ( European Environmental Agency) of the European Union published their latest report on climate change, stating that European Atlantic/Continental border regions such as Denmark must prepare for warmer winters with heavy precipitation and storms (including coastal flooding events) and more dry summers with draughts and forest fires. Quote chairman of the EAA: “Climate change will continue for many decades to come. The scale of future climate change and its impacts will depend on the effectiveness of implementing our global agreements to cut greenhouse gas emissions, but also ensuring that we have the right adaptation strategies and policies in place to reduce the risks from current and projected climate extremes. Edited by AllanDystrup, 02 February 2017 - 08:57 AM. My first RFOs (Rich Field Objects) will be stellar associations: groups of stars - often with associated nebulosity -, that have a common origin and are close to our solar system in the Milky Way galaxy. Hence they look looser, brighter and larger than what we typically classify as open clusters, and thus they are often more easily observed in challenging observing conditions. some are older (~1-5 GYR) weakely bound Moving Clusters with stars of common origin, like the Plough in UMa - including our own sun -, and the Hyades in Taurus. My first RFO target is the Orion OB-1 stellar association, which includes dozens of giant luminous O- and B-type stars embedded in the large Orion Molecular Cloud (OMC) complex. Around 12 MYR ago the shock waves of early supernovae in this association blew out the Orion-Eridanus superbubble, including Bernard’s Loop and the Witch Head nebulae, and at the same time initiated an intense star formation in the interstellar gas and dust medium (ISM), including 4 main subgroups of O-and B-stars plus thousands of lower-mass protostars. 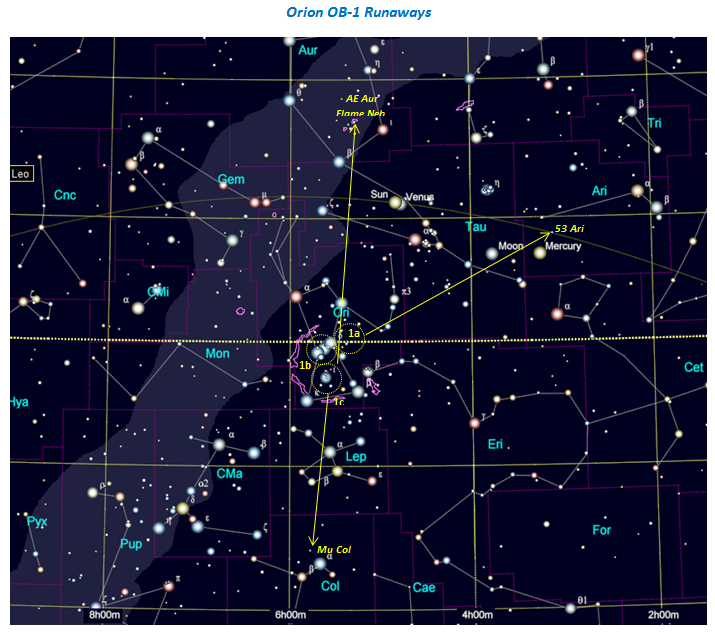 Orion OB1b –Orion’s Belt, age 2-8 MYR, incl. Delta, Epsilon and Zeta plus Sigma Ori. Orion OB1c – Orion’s Sword, age 2-6 MYR years, incl. NGC 1981, NGC 1973/5/7 and Iota Ori. 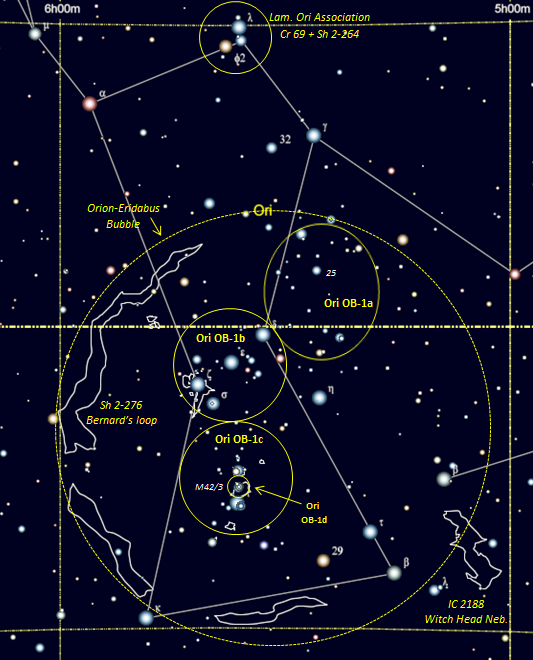 The Orion OB-1a subgroup of the stellar association is located at Orion’s upper hip, just NW of the belt star Delta Ori. It is the oldest (~12 MYR) and largest (960’ x 960’) of the subgroups, created when shock waves from supernovae in the Gould’s Belt hit the Orion Molecular Cloud (OMC). This event initiated an intense stellar burst, and after ~4 MYR some massive O-stars from the first generation in the OB-1a association went supernova. This event blew up the Orion-Eridanus Bubble in the OMC (creating Bernard’s Loop and the Witch Head), which then initiated the stellar burst of the second Orion subgroup: OB-1b. On my drawing, only Del Ori (Mintaka, which belongs to the OB-1b association) is type O, while most of the other bright stars are massive early type B stars (with a few exceptions such as: Ori 31, 27 and the group around 21 Orionis). Furthermore, most of the fainter stars I was able to spot in my rich field view are later type B-stars. The OB-1a group contains a cluster of somewhat younger (7-10 MYR) stars centered around 25 Ori. This cluster was probably created by the passing supernova bubble, that also initiated the OB-1b subgroup. Most of the members of this cluster are of 10-11m and fainter magnitudes, so I was not able to spot them using my wide field 14x mag. eyepiece. An interesting project, for sure! However, I would have believed that it was precisely this kind of objects that benefitted the most from dark and clear skies, especially since you're going to use such low magnifications? Now that we're talking about hazy nights, I was out yesterday evening and it was certainly hazy! Strangely, deep-sky contrast wasn't bad, but the objects were *severely* dimmed. I opted to observe a number of double stars instead. I think I probably should do more double star work again, as they're not hit particularly hard by haze. Excellent all around - great scope, great project, great information, and a great sketch. I will be following this with great interest. Well Thomas, my recent experience observing in low transparency has been, that some DSO objects, I wanted to study (such as M79 and M46), were right out impossible or very hard to see any details in. ...While at the same nights, I was able to see at least the brightest members of several close and wide stellar associations. You are also right, that some of the smaller/more distant and hence fainter OB-associations and nebulae will benefit from higher magnification than 14x-20x, -- but I will have no problem adjusting the magnification and FOV on my setup to fit the given object, while still aiming at a reasonable "rich field" experience. I do plan to do that. Like you, I am also contemplating a double star project, which I plan to do with my classic Zeiss C63/840 Telemator (I do have the position circle, so there's really no excuse :-) -- but I'd like to at least round up all the (possible from my latitude) Messiers with my 80mm refractor, before setting out on that journey. And now I also have the brighter rich field objects to hunt down on hazy nights (ahh, but that "foggy, foggy dew..."). Edited by AllanDystrup, 02 February 2017 - 12:54 PM. The southernmost Messiers are extremely hard from our latitude. My personal strategy has been to mostly ignore them, except on those very rare, perfect nights, where it's clear right down to the horizon. There are more than enough interesting and overlooked bright NGC (and others) to make up for them. Allan, I've been getting progressively more interested in stellar associations for some time, but I'm not familiar with the technical literature. Are there any particular sources you'd recommend for someone just getting started in this area? Do a Google search for "Gould's Belt." And don't forget to select the images tab as well; there are pages of those which can lead to interesting byways.This will dredge up much good material to keep one busy on a cloudy night or two. The Gould Belt is a fascinating sub-structure of our Local spiral arm, within which we coincidentally happen to be located. It traces a great circle about the sky, tilted some 18 degrees to the galactic equator, and is nicely delineated around its periphery by numerous, young OB associations. Indeed, most of the better ones accessible to us are the Gould belt associations, due to their nearness, ranging from about 475 to 2,000 l-y. Many of the non-Gould belt associations, and particularly those more distant than about 5,000 l-y, are not so readily discriminated due to confusion with the profusion of unrelated field stars along the lines of sight. They tend to blend camouflage-like into the general starry richness of the milky way. In such cases, the more prominent clusters and nebulae (skies/filters permitting) often associated are what will call attention. Edited by GlennLeDrew, 02 February 2017 - 06:52 PM. Mwedel , -- I consider myself a newbie to this area of astronomy, and though I've looked around, I haven't found any single "consolidated" source of information for these interesting objects. The closest is actually Glenn LeDrew's excellent summary of the Gould's Belt complex (see ref above), which puts the large scale OB-associations and nebulae in the neighbourhood of our sun into context, structurally as well as evolutionary. I can only recommend Glenn's article as a starting point for understanding and observing stellar associations. Glenn, -- Thanks a lot for the reference to your primer on the Gould's Belt -- you've done a great service to the community by researching, compiling and presenting this information to fellow amateur astronomers! Edited by AllanDystrup, 03 February 2017 - 05:45 AM. The star formation in the Orion OB-1b subgroup was sparked around 5-8 MYR ago by the first supernovae in the older Orion OB-1a subgroup. It contains the three massive, hot and bright blue-white supergiant belt stars: Zeta (Alnitak, type O9), Eta (Alnilam, type B0) and Delta (Mintaka, type O9) Orionis. 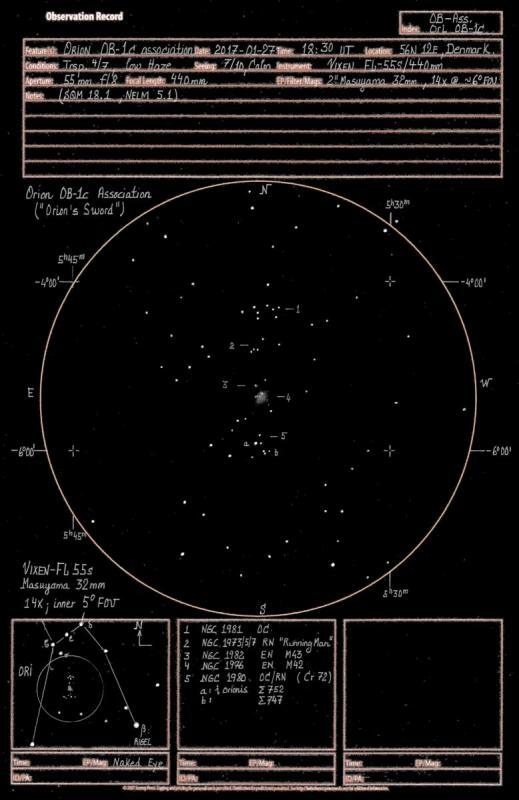 The multiple star system Sigma Ori (type O9), although younger ~2-4 MYR, is also included in this subgroup, as are the >100 fainter stars in the cluster Collinder 70, of which the brightest (most of which are 6m-8m B-stars) are arranged in a beautiful chain, winding like a figure ”S” around the middle belt star Eps Ori, -- strikingly reminding of a pearl necklace. How fitting indeed, that the root of the arabic name for Epsilon Orionis, ”Al nażm” means: “String of Pearls”! The strong UV-radiation from the hot Sigma Orionis giant is responsible for exciting the hydrogen gas in the close by IC434 emission nebula, making it glow faintly in red, thus forming a backdrop for the embedded Horsehead dark nebula (B33). To the south-east of Zeta Orionis is the Flame emission nebula (NGC 2024), lit up by hot stars inside the gas, with dark lanes of dust obscuring the central part.These fragments of the OMC are considered part of the Orion OB-1b complex, -- but they are too faint to be observed by my rich field setup. Edited by AllanDystrup, 03 February 2017 - 10:03 AM. Nice endeavor. 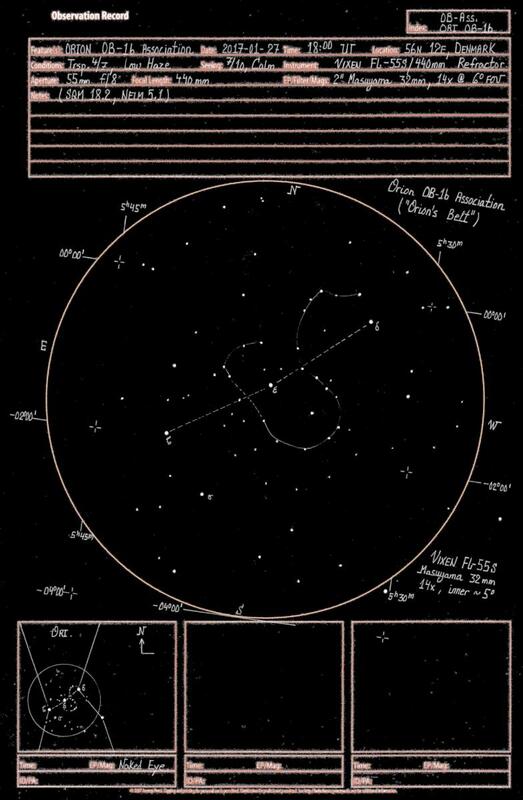 If you look up Mel Bartells in the sketching forum you'll see some of his Integrated Flux Nebula drawings. I do miss my 70mm achromat for its low power widefields, gotta get one whdn monies better. Allan, that's another great sketch of Orion's belt. Sigma Orionis is one of my favorites. Somehow it had fallen through the cracks in my observing until a couple of years ago, but now I check in on it almost every time I go out. According to the Wikipedia page (link), Sigma Orionis is the heart of a small open cluster which is itself a subset of Orion OB-1b. I don't know how many other cluster members are visible in amateur scopes, but that area seems ripe for a closer investigation (by me, I'm not trying to give you any more work!). Thanks again for starting this thread. I've pointed it out to friends of mine who are also stuck under less-than-perfect city skies, and we're excited about having some new targets for nights when we can't get out to anywhere darker (although I'm sure we'll be revisiting these areas when we can do so under dark skies). I'm looking forward to more installments as time and opportunity allow. Here's an observation I made 2 years ago, of the main components, Sigma Ori ABDE (STF 762) and STF 761 ABC. I didn't catch the close STF 762 c, nor the faint STF 761 E.
which are also considered members of the cluster in a wider sense -- nice! And now I'll definitely do a wider field study of the cluster, and compare it to the splendid Wiki photo! Edited by AllanDystrup, 03 February 2017 - 02:36 PM. I have started viewing OB Associations as well. But the Southwestern US has had some truly bad weather until recently. I do hope that it will clear up for New Moon in February. Once I get some viewing done I will post. The latest edition of The Backyard Astronomer's Guide contains a milky way atlas I made specifically for the book. It delineates the Gould Belt midplane and all its associations, as well as a fair number of other OB associations in the Local, Sagittarius and Perseus arms. It plots stars to magnitude 9, in color based on their B-V color index, and in a pseudo-photorealistic format. I wrote the software to generate the plots, and did much work in Photoshop to realize the finished appearance. While my own approach is based on using image intensifiers, I completely understand your intent and can assure you that it is an undertaking that could be very rewarding. Even in a 40 degree true field, I look around and see these great star associations all over the sky. Most I am sure are uncatalogued and probably are not truly related in any way, but in a 40 degree and 12 degree true field I see wonderful groupings all over the sky. I think your project will be fun and hope you enjoy it. Relatively short time (~2 MYR) after the Orion OB-1b subgroup was created, the third large area of stellar birth in the Orion OB-1 association was sparked, developing into the Orion OB-1c subgroup, the ”Sword” of Orion. This is a marvelous area to behold in a rich field telescope! In the center of my ~5° view is the Great Orion Nebula, M42, - the gigantic hydrogen and dust cloud ionized by Theta-1 Orionis (the Trapezium, with one O6 plus three early B main components). Also seen just SW of the Trap is the string of three components forming the Theta-2 Orionis complex (the Orion ”Mini Belt”), and to the NW of the Trap is a faintly hazy ~6m B0-star marking the center of M43 (the De Marian or Comma Nebula). North of the bright M42-43 emission/reflection nebulae is a small cluster of stars lightening up three fainter fragments of reflection nebulae (NGC 1973/75/77 – the ”Running Man”). The nebulosity however can’t be seen in my rich field setup. Still further up north is the open cluster NGC 1981, commonly known as the ”Alligator OC” (I, however, tend to see it as the Bucking Bronco, -- and if I include the ~6m star just to the N, I can even see a Buckaroo on the Bucking Bronco... ). South of M42 the ~3m O9-star Iota Orionis immediately catches the eye. This is a wonderful multiple star system (reminescent of Sigma Orionis in subgroup OB-1b). I can’t resolve Iota itself (STF 752), but I can see the two components of STF 747 just SW of Iota, and I (think I) can glimpse STF 745 to the east, as a faint ~8m star... The whole group is cataloged as NGC 1980 (also known as CR 72), and there’s some reflection nebulosity from the OMC associated with Iota’s strong radiation; But I can’t see this in my wide field view. All in all this has to be one of the best wide field views in the night sky for small telescopes, and besides the beautiful overall view, there are endless details to hunt down in open clusters, double/multiple star systems and all types of nebulae (EN,RN,Dark). The central region of OB-1c has even been designated its own subgroup : Orion OB-1d, because of its young age (< 0.1 MYR), where the shock waves from the newborn hot OB-stars are ramming into the dense ISM, giving rise to several stellar nurseries, including HH-objects and T-Associations embedded in M42-43. Edited by AllanDystrup, 05 February 2017 - 01:08 AM. 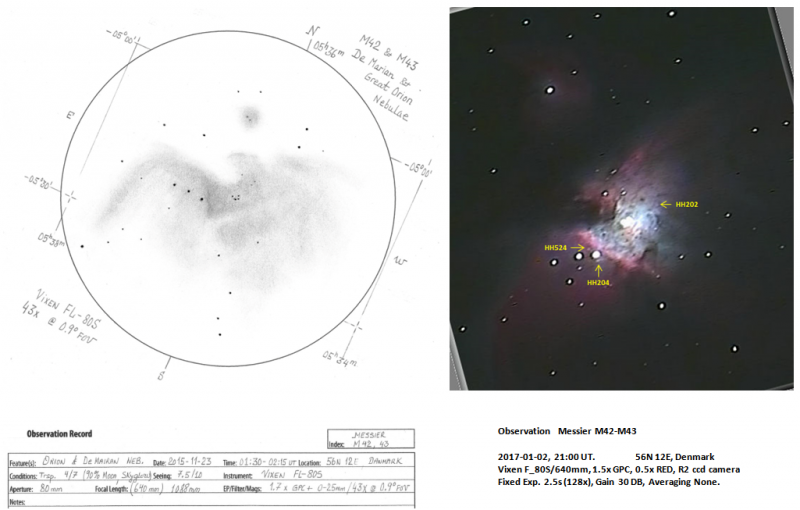 Here's a couple of my recent recordings of Orion OB-1d (the M42-43 region of "The Sword"). The first is a drawing at 43x in 0.9dg FOV (80mm refractor, 25mm orthoscopic EP). The second is a snapshot from a live video session, using my small R2 security cam at 110x in ~½dg FOV. I have marked some HH-objects I was able to locate on the image. I'd be interested in any sources describing further structures in the M42-23 nebulae, such as shock fronts, HH-objects, T-associations, dark nebulae and other. Edited by AllanDystrup, 04 February 2017 - 07:50 AM. Back in my 'sketching' days, during the mid-90's, I used an old University Optics 80mm f3 RFT to sketch a number of OB associations. 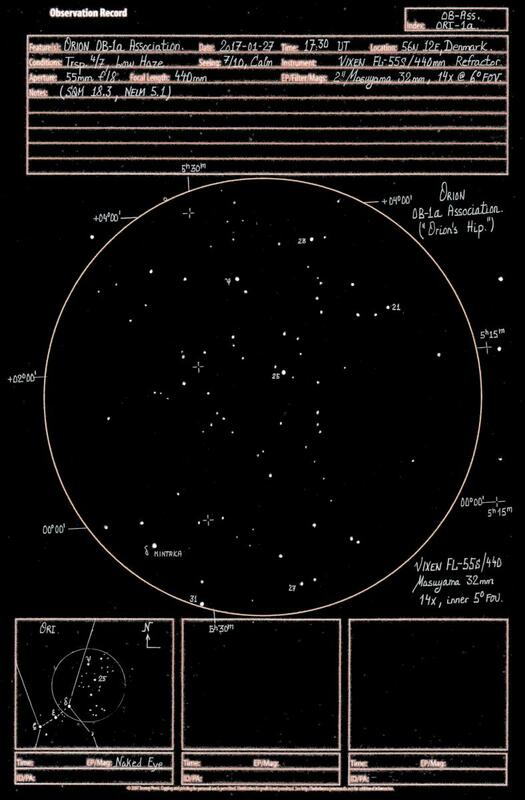 At the time, my main source of finding these objects was from a Sky & Tel article in their Jan 1986 issue - "IN PURSUIT OF O-B ASSOCIATIONS"
Besides the Orion objects, which you can see on my page, my favorite is Perseus OB-1 (Double Cluster) & OB-3 (Alpha Persei Association). Nowadays, I've gone totally over to the dark-side, given up sketching for video-astronomy! While observing and contemplating these stellar families, don't overlook their wayward children, the runaway stars. For instance, three runaways are far removed from Ori OB1; AE Aur, lighting up the Flaming Star nebula, mu Col and 53 Ari. The latter escaped from OB1a, it seems, while the first two appear to have been ejected by OB1c, if not the Trapezium itself. The other star related to this runaway pair could be the more massive omi Ori, itself appearing to have escaped the Trapezium at a much lower velocity. Fascinating dynamics! Another interesting runaway; nu And, located very near M31, having been ejected from the Lac OB1 association. And yet another; zeta Oph, lighting up the huge and dim nebula Sh2-27, escaped from the Sco OB2 group, also known as Upper Sco. It's neat to see and to contemplate upon how far these stars have traveled across the sky in the roughly one million years since leaving their parent groups. A handy rule of thumb: One km/s very closely equals 1 pc/Myr. Another fiducial of sorts, by which to compare: Earth orbits the Sun at nearly 30 km/s, meaning that after 1 million years it has covered nearly 30 parsecs! The runaway star velocity criterion is taken to be 30 km/s and faster, with respect to the local standard of rest at the parent group's location. I forgot to mention why the seemingly arbitrary runaway velocity threshold is 30 km/s. It's 3-sigma larger the velocity dispersion of 10 km/s for young disk objects. The 3-sigma envelope for a Gaussian distribution includes 99.5% of the sample. Beyond this, statistically we can take such 'outliers' as having a good probability of being not of the population most represented by the data. Young disk objects born of the molecular clouds confined to the thin disk--where most star formation occurs--necessarily share the same nearly circular orbits about the galactic center. This near circularity results from the tendency for colliding gas clouds to settle toward circularity of their orbits, for the same reason that the particles in a planetary ring system do. The molecular cloud velocity dispersion is about 7 km/s, while the young star velocity dispersion is a slightly higher 10 km/s due to the 'warmer' kinematics resulting from gravitatinal encounters in compact systems that lead to escape for some. Over time, continued 'disk heating' due principally to massive molecular cloud encounters 'stirs up' the stellar population, making for more elliptical orbits and also inducing increased vertical oscillation through the disk plane. This increases the velocity dispersion, pretty much continuously with time. Youthful stars which have a significant peculiar velocity with respect to their local standards of rest are therefore likely to have acquired such motion from an ejection event. The two mechanisms possible are dynamical, where a binary, trinary, etc., is disrupted by an internal or external stellar encounter, or via a supernova in a binary system (the pair unbinds after the shell material from the blast passes the orbit of the companion.) In either scenario, a star in a close orbit can have a velocity up to about 200 km/s. Initially after the unbinding event it would be departing at up to this speed, decelerating due to the (decreasing) gravitational attraction by its former companion(s). And so we can have hot, young stars like AE Aur and zeta Oph purely by chance lighting up remnant periheral gas in departure/dissolution (Sh2-27), or even quite unrelated clouds (IC 405) as they whiz through space. Hold the phone - an 80mm f/3!? Refractor? Reflector? I have a strong, verging on unhealthy, interest in RFTs. I'd love to know more about that scope. Glenn, thanks for the info on runaway stars. That 1 km/s ~ 1 pc/Myr thing is both helpful and mind-blowing. As a paleontologist by day and a stargazer by night, I'm always looking for ways to wrap my own head around the scales of time and space we're dealing with, and to convey them to others. The idea that there are as many kilometers in a parsec as there are seconds in a million years is a stunner. 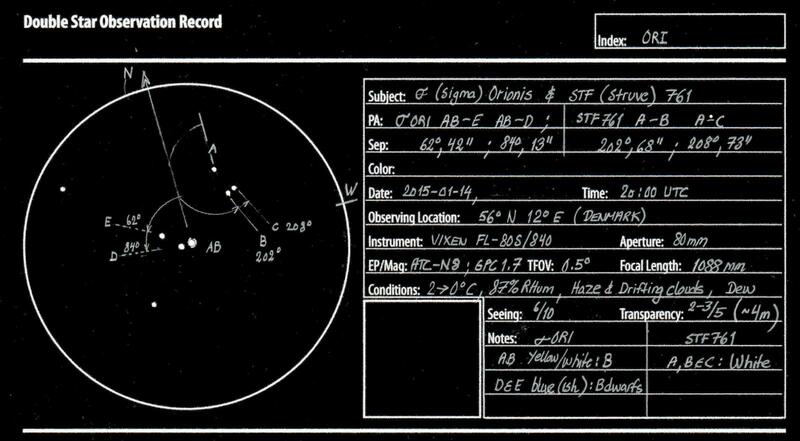 Here are the three slingshot "runaways" from the Orion OB-1 complex, as described by Glenn . The three hot O/B stars were all evicted by supernova explosions and/or close gravitational interactions, -- the 5m type B1 53 Ari left 4-5 MYR ago at a speed of ~50 km/sec, while 6m type B0 AE Aur and 5m type O8 Mu Col left later (~2½ MYR ago) but faster (at 100 km/sec). The radial movements of all three can be traced back to the same stellar nursery in OB-1 (”three flew over the cucoo’s nest...”). One theory states, that AE Aur and Mu Col were a binary, that got too close to another double/multiple star system (very probably the Iota Orionis group), which got them torn apart and flung out in opposite directions. Edited by AllanDystrup, 05 February 2017 - 04:04 AM.